Hey there friends! 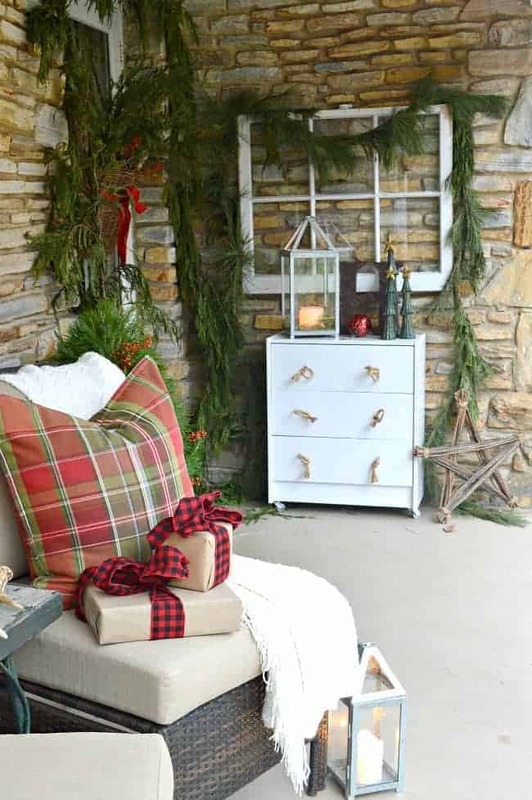 Before we take a peek at our Christmas porch, I just wanted to thank you all for the lovely comments and emails from our cozy Christmas cottage tour. I really enjoyed reading each comment and hearing about your Christmas decor and where you put your tree in your own home. I am truly grateful that you took the time to stop in to tour our home and share your thoughtful comments. Thank you! This is the first house we’ve ever lived in that’s had a covered front porch and we really enjoy it. The hubs loves sitting out there after dinner, on a warm night, and watching the world go by. I enjoy that too but, if I’m totally honest, I really love decorating it each season. I decorated the outside with the same thought as inside, traditional Christmas colors and lots of greenery. I didn’t do a traditional wreath this year. Instead I filled my hanging basket with fresh greens, berries and pinecones from our yard and added a couple of birch sticks. A bow around the basket and the front door is good for the season, and it didn’t cost me a dime. A large lantern and wooden trees were added to the IKEA Rast, that I turned into a garden tool storage chest. The other side of the porch is the spot we enjoy most. I got these outdoor chairs from Wayfair and love them. They are sturdy and so comfortable. It’s the perfect spot to hang out and watch the world go by. This past weekend, I hung wreaths with red ribbon on all of my front windows. I was going to use real but I found these nice faux ones for about the same price. I like that I can use them again, for years to come. That’s it for the tour our cozy Christmas porch. How about you? Have you started your decorating yet? I love your porch and your dog is too cute! The mix of greenery and plaids are perfect. 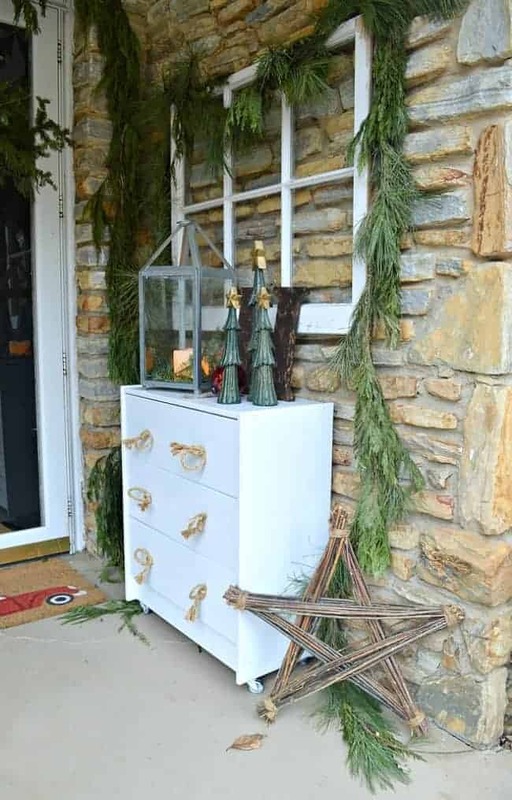 I’ve included this in a holiday front door roundup and pinned. 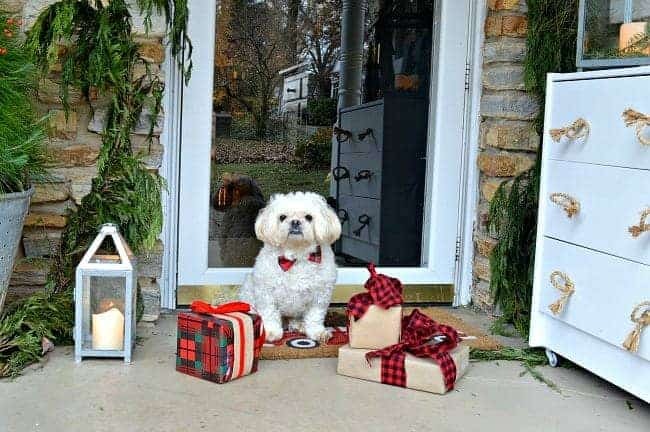 I am loving your porch! Ok I admit Finn too, he is just adorable! Thank you for sharing your wonderful post at #OverTheMoon. I look forward to what you will share next week! Do something special. Give yourself a standing ovation today! We hope you’ll come back again next January 8 when we open our doors at 6:00 PM EST. Pinned and tweeted! I love your porch. I’m envious, it’s so festive. 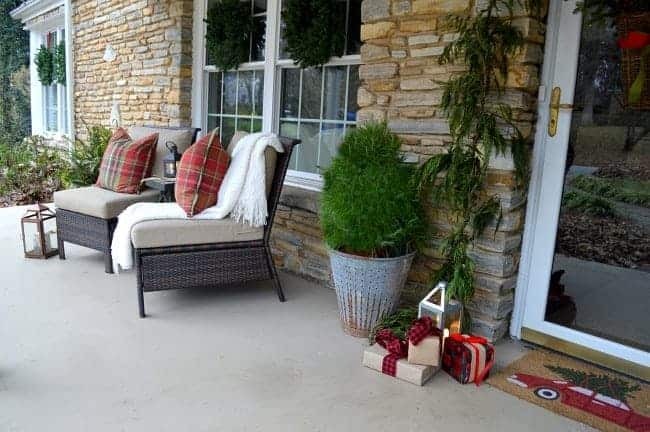 I have a small stoop, so it’s time like this I wish I had a covered porch too. Happy Holidays. Thanks Rhonda! I have always had a small stoop so I know exactly how you feel. This is my first real porch so it’s been fun decorating it. 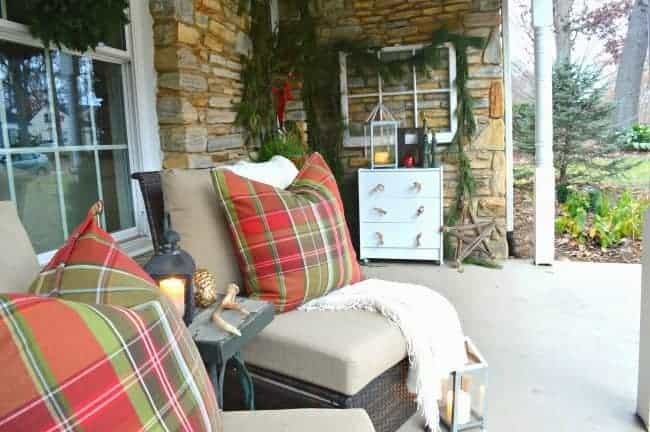 Your porch is so fun and inviting! 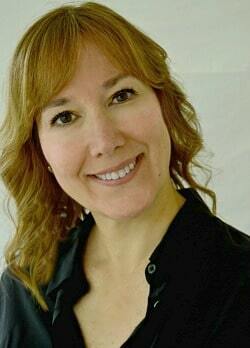 Thanks so much, Pamela. Merry Christmas to you! Good Evening Kristi, I love that you have filled a cane basket with greenery, to hang on your door, it really looks lovely…. 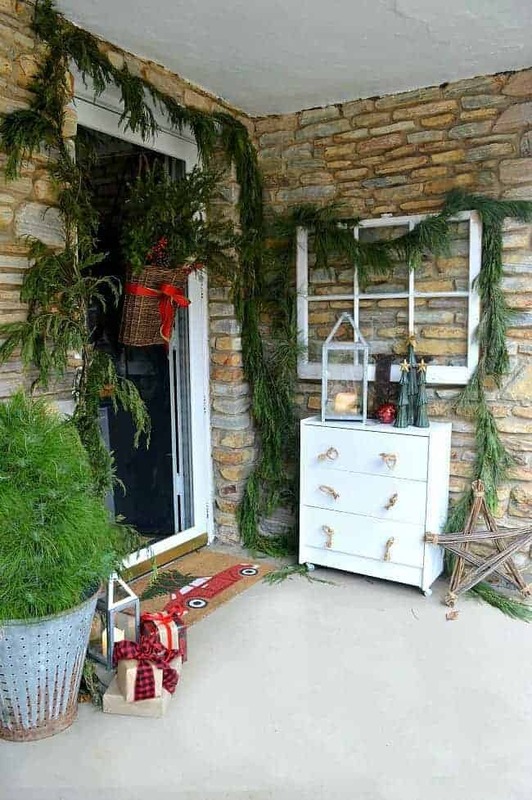 and I love the American style of hanging wreaths at the windows, I think it looks beautiful. I remember visiting my daughter, at Christmas time, when she lived in Dunwoody, Atlanta, and we strolled around the houses looking at all the beautifully decorated homes. …. and what a treat to have an outside porch so beautifully decorated for Christmas. My husband would be the same, he would love to sit and watch the world go by. 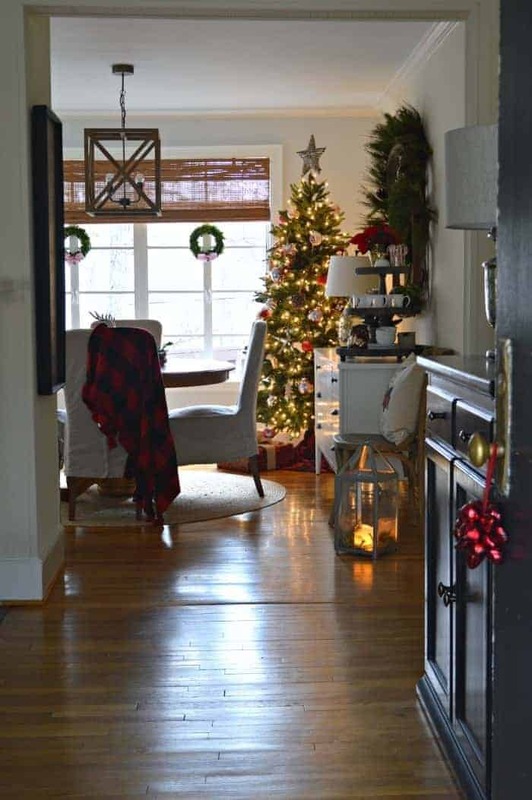 This year I am not decorating, because we are visiting our daughter who now lives in Chicago…. I am very excited. …. and what can I say about Finn…. apart from…..he’s absolutely gorgeous. Hi Daphne. I’ve never visited Europe, or England, during the holidays but I would imagine it would look a lot different than what we do here in America. 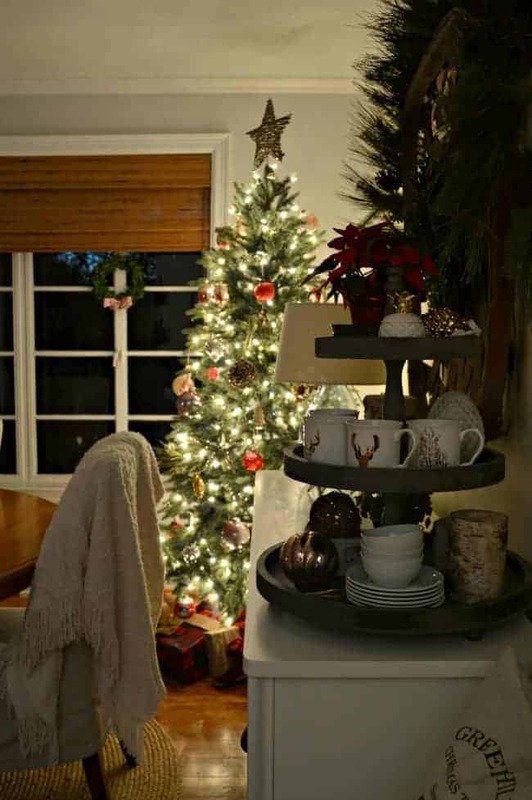 I have never been one to go overboard, well…in my eyes anyway, but I know a lot of folks who decorate every nook and cranny. I don’t blame you for not decorating this year. When we’ve gone out of town to visit our daughters over the holidays, I don’t do much either. What’s the point, right? I’m sure you are very excited to visit your daughter. We lived in Chicago for 5 years and spent last Christmas in the city. It’s beautiful, but I won’t miss the bitter cold. Hope you enjoy your holiday and your visit. Safe travels! Thanks for stopping by and Finn thanks you for the compliment. 😉 I think he knows he’s cute. I love your porch rug. Would you mind telling where you purchased it? I would love to have one here in KY. 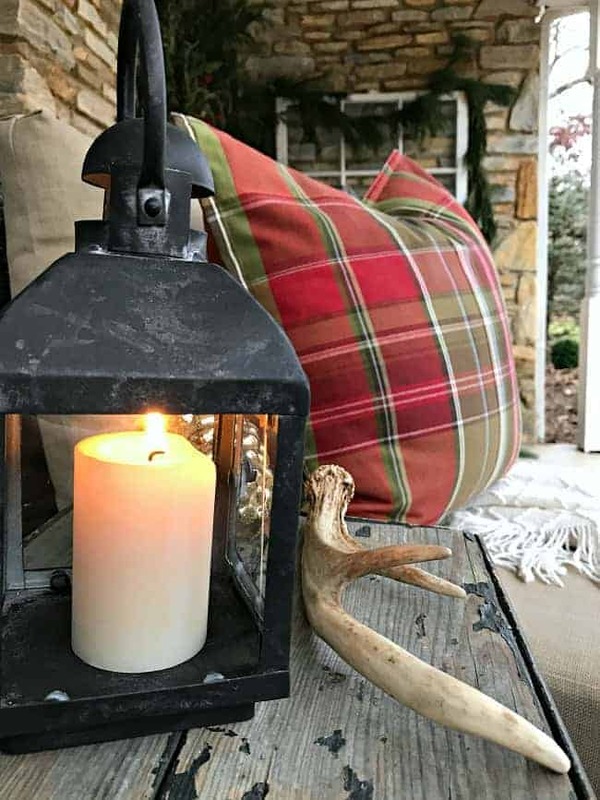 The view into the house from the porch looks so cozy and welcoming as do the porch. Very Cottage cozy. Thanks Debbie. I wanted to do a wider view from the yard but, oh my goodness…it was a mess. I hope to do a tour in the spring. Hope that you are doing well, my friend. Oh, it’s very sweet! 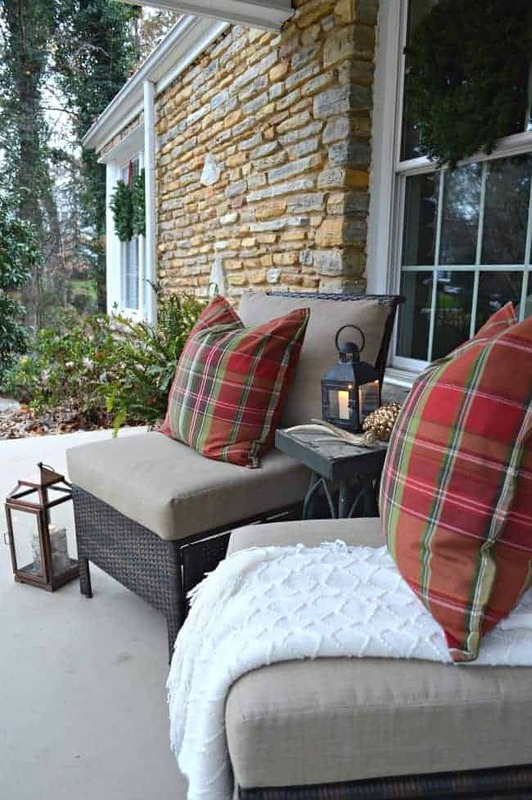 I know you’re enjoying your porch and the rest of your new-to-you home this first year! Your porch is lovely and I like your new photograph. Awww, thanks so much for noticing my new photo, Rita, and for touring our Christmas porch. 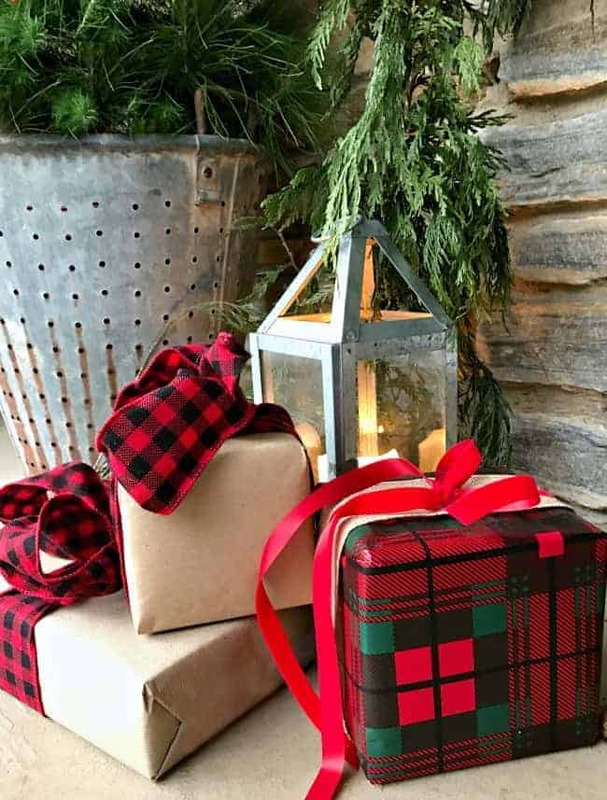 Love your use of the traditional red and green Christmas colors. I am so tired of decorators using white and more white with a little blue stuck here and there. Unless you live at the beach. Also, so many trees look like department store trees loaded down with stuff. Yours looks great. Very fitting to your cottage style. It is beautiful. I would never think to put a chest out on the front porch. You did and it’s awesome. Merry Christmas. Thanks so much, Jacky, I appreciate your sweet comment. 🙂 We really love the stonework on the house. It’s what made me fall in love with the house before it was on the market. Well, if you’re Wilson, what does that make me?